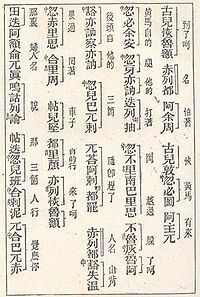 The Khitan spoke a Proto-Mongolic language called Khitan language and had developed two scripts for writing their language: Khitan large script, a logographic script derived from Chinese characters, and Khitan small script, derived from Uyghur. At the very beginning of the Mongol Empire, around 1204, Genghis Khan defeated the Naimans and captured a Uyghur scribe called Tata-tonga, who then adapted the Uyghur alphabet—a descendant of the Syriac alphabet, via Sogdian—to write Mongol. With only minor modifications, it is used in Inner Mongolia to this day. Its most salient feature is its vertical direction; it is the only vertical script that is written from left to right. (All other vertical writing systems are written right to left.) This is because the Uyghurs rotated their script 90 degrees anticlockwise to emulate the Chinese writing system. In 1587, the translator and scholar Ayuush Güüsh created the Galik alphabet, inspired by Sonam Gyatso, the third Dalai Lama. It primarily added extra letters to transcribe Tibetan and Sanskrit terms in religious texts, and later also from Chinese and Russian. Later some of these letters officially merged to traditional alphabet as group named "Galig usug" to transcribe foreign word in today's use. In 1648, the Oirat Buddhist monk Zaya Pandita created this variation with the goal of bringing the written language closer to the actual Oirat pronunciation, and to make it easier to transcribe Tibetan and Sanskrit. The script was used by Kalmyks of Russia until 1924, when it was replaced by the Cyrillic alphabet. In Xinjiang, China, the Oirats still use it. 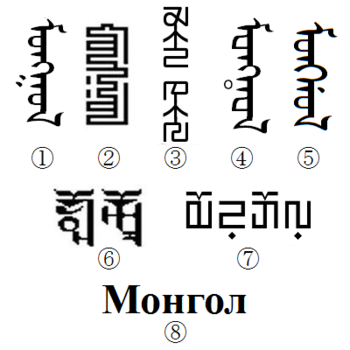 "Mongol" in Horizontal Square script. At around the same time, Zanabazar also developed the horizontal square script (Хэвтээ дөрвөлжин), which was only rediscovered in 1801. The script's applications during the period of its use are not known. It was also largely based on the Tibetan alphabet, read left to right, and employed vowel diacritics above and below the consonant letters. Additionally, a dot was used below consonants to show that they were syllable-final. Horizontal square script is included in the Unicode Standard under the name "Zanabazar Square". The Zanabazar Square block, comprising 72 characters, was added as part of Unicode version 10.0 in June 2017. Before the 13th century, foreign scripts had to be used to write the Mongolian language. And even during the reign of the Mongol Empire, people in the conquered areas often wrote it in their local systems. Most often it was transcribed phonetically using Chinese characters, as is the case with the only surviving copies of The Secret History of the Mongols. Subjects from the Middle East hired into administrative functions would also often use Perso-Arabic script to write their Mongolian language documents. On 1 February 1930, Mongolia officially adopted a Latin alphabet. On 25 March 1941, the decision was reversed. According to later official claims the alphabet had turned out to have not been thought out well. It was said not to distinguish all the sounds of the Mongolian language, and to be difficult to use. However, those seem to have been pretexts rather than the true reasons. Using "y" as feminine "u" /u/, with additional feminine "o" ("ө") /ɵ/ and with additional consonants "ç" for "ch" /tʃ/, "ş" for "sh" /ʃ/ and ƶ for "zh" /dʒ/, it successfully served in printing books and newspapers. Many of the Latin letters (f, h, p, v) were even rarely used while q, w and x were completely excluded. The adoption of the Cyrillic script a short time later, almost simultaneously with most Soviet republics, suggests political reasons. The most recent Mongolian alphabet is a based on the Cyrillic script, more specifically the Russian alphabet plus the letters, Өө ö and Үү ü. It was introduced in the 1940s and has been in use as the official writing system of Mongolia ever since. ^ Pandey, Anshuman (2015-12-03). "L2/15-337: Proposal to Encode the Zanabazar Square Script in ISO/IEC 10646" (PDF). ISO/IEC JTC1/SC2/WG2. ^ "Unicode 10.0.0". Unicode Consortium. June 20, 2017. Retrieved June 21, 2017.